The literal if somewhat clunky translation of Một Mai Giã Từ Vũ Khí is Farewell to Arms One Day. Or “some day.” Or, if stretched, even “tomorrow.” “One day” isn’t unimportant: the absence of precision implies uncertainty, as war isn’t over until it is really over. For the sake of brevity and aesthetics, however, I will shorten it to Farewell To Arms, just like the title of Hemingway’s novel. The author of Farewell to Arms is Nhật Ngân, one of the most successful South Vietnamese composers. He sometimes went by the name Ngân Khánh, as seen from the cover above, and was a member of the trio Trịnh Lâm Ngân. (Only two of them were involved in songwriting, with the third in other aspects of production.) He was the lone author of this song, although it is often credited wrongly to the trio. It is probably his most fully realized song. Well constructed and breathtakingly moving, it carries a perfect combination of thought and feeling. Remember the acting trick to shed tears by thinking of something sentimental and sad? I am neither an actor nor a teary type, but this song should do that trick. Once or twice, I listened to this song while driving on the freeway and nearly got off an exit for fear of causing an accident. To call Farewell To Arms well-known is an understatement. It may not match the enormous popularity of two other Nhật Ngân tunes. Tôi Đưa Em Sang Sông – I Take Her Across the River, but better is the loose translation Farewell My Love – is a “love lost forever” song about bidding farewell to a young woman soon to be married to someone else. Then there is Xuân Này Con Không Về – I Can’t Come Home This New Year – whose lyrics come from a letter by a soldier to his mother telling that he could not go home for the Vietnamese New Year Tết due to duty. Further, it is my top choice because it provides wonderful continuity about the Vietnamese experience of war from another terrific “peace song.” And not just any song, but one composed by the greatest twentieth-century Vietnamese songwriter. After making my choices, I was quite surprised that not a single song from Phạm Duy made the list. Upon reflection, however, I thought it makes sense because Phạm Duy’s best war-themed songs came from the period of the French War of 1946-1954. Arguably, Phạm Duy’s most famous song in this category is Ngày Trở Về or Day of Return. It tells the perspective of a wounded veteran of the French War returning to his village at the end of war. Since its publication in 1954, this classic was recorded by many major singers in South Vietnam, including Duy Khánh (whose video is below) and Thái Thanh, Phạm Duy’s sister-in-law and possibly the greatest interpreter of his songs. Ngày Trở Về was first published in the year of the Geneva Peace Accords that concluded the French War and divided Vietnam into half, supposedly for a short time. Nearly twenty years later, or around the time of Paris Peace Accords, came Một Mai Giã Từ Vũ Khí. They shared the same sentiment, desire, and longing for returning to normalcy and peace. Moreover, both songs feature a soldier from the countryside to articulate the desire of an entire people. Having compared the lyrics closely, I find enough similarity in images and vocabulary to suggest – no, to conclude – that Nhật Ngân borrowed extensively from Phạm Duy. At the least, he was inspired by his older colleague’s classic when he wrote this classic of his own. Below are the lyrics of each song. First is the Phạm Duy, whose long lyrics are structured according to a three-line pattern. Nắng vàng hoe, vườn rau trước hè cười đón người về. Tiếc rẵng ta đôi mắt đã loà vì quá đợi chờ. Over the dike to the bamboo village wall. Oh too bad, her eyes are near-blind from the long wait. Sống say mê, đường xa lắm khi nương hồn về quê. Luống nghẹn ngào, hẹn sớm tinh mơ anh về đồng lúa. Exciting life over long travel, but his soul often thinks of the village. The teary stalks await for his return in early morning. Có con trâu xanh hết lòng giúp đỡ. Có anh thương binh sống đời hòa bình. The buffalo shall labor hard for him. The disabled veteran now has a peaceful life. Có nhiều khi đời hoa chóng già vì thiếu mặn mà. Gió về đâu, còn thương tiếc người giọng hát rầu rầu. Some have aged much without the menfolk around. A morning song spreads over the mulberry farm. The wind blows in missing the singer with a poignant voice. Ai nhớ chuyện ai, chuyện người con gái? Chiến binh ơi, vì sao nát tan gia đình yên vui? Chớ thẹn thuồng vì nếu tôi quen em ngoài đồng vắng. Remember the story of a young woman? Veteran, what but war has separated the happy family? Be not shy if I speak to you at the rice field. Những khi tan công, hết việc, xếp gánh. Có đôi uyên ương sống đời mặn nồng. After doing their work at field and home. Coupled to the slow pace of the music, the images drawn by Phạm Duy create a vision of normality, where the uncertain speed of warfare is replaced by the regularity of daily rural life. An urbanite, Phạm Duy nonetheless lived in the countryside during the French War and observed. Not only he puts out many loving details for this song, but the details also make up a whole picture and help to create a classic Vietnamese popular music. 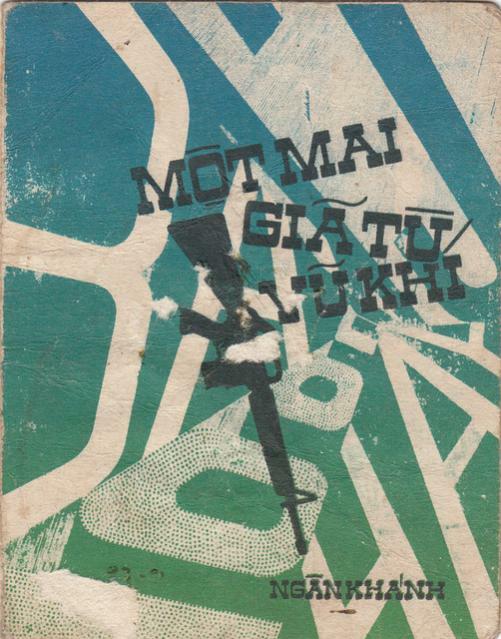 Phạm Duy’s classic includes a good deal of anthropomorphism, especially on farming. There is little anthropomorphism in the Nhật Ngân song, but there is still much in common. Here are the lyrics, plus a recording by Duy Khánh. Anh chẳng còn chi, chẳng còn chi ngoài con tim héo em ơi! Đã bao phen máu anh tuôn cho còn lại đến mãi bây giờ. I have nothing left, nothing left but this wilted heart, my dear. Often have I shed blood until today. Trả súng đạn này, ôi sạch nợ sông núi rồi. Anh trở về quê, trở về quê tìm tuổi thơ mất năm nao. Đã bao năm vắng chân anh nên trở thành hoang phế rong rêu. Return these arms, oh, I’ve fulfilled my debt to the country. I return to the village, to the village and find the lost youth. Since my absence, they have been abandoned without care and repair. Ta làm lại từ đầu. Xin cám ơn! Xin cám ơn người nằm xuống. Thank you! Our thanks to the departed. Long have I wished for this paradise! Here are a few examples: the Phạm Duy in orange on the left and the Nhật Ngân in blue on the right. A longer comparison has to do with a very common reaction after war: the desire to get married and have a family. Với miếng cau, với miếng trầu, ta làm lại từ đầu. The endings do not match in words; nonetheless, they share the same vision of normalcy and happiness in the old and simple. I don’t mean to say that Nhật Ngân merely took after Phạm Duy; I don’t think the song could reach its potential if he did. He also innovated. For example, Mr. Cao Đức Tuấn has argued in a detailed analysis that the weaponry named in the first verse – the object of the farewell in the song title – are meant for defensive warfare: barbed wire, trenches, crenels (arrowslits), mines, and arms. They highlight the defensive nature of the Vietnam War on the part of the South Vietnamese military. I’ll need to think more about this interpretation, but it is definitely worth thinking about. Another innovation is the special attention to deceased soldiers in the second half of the refrain. It illustrates the greater suffering than that during the French War. There is also a difference in attitude of the narrators. Both wars were long and exhausting for combatants and civilians, but I don’t think anyone will dispute that the Second Indochina War was far more brutal and destructive than the first one. The military experience of the veteran in Ngày Trở Về towards the Vietnamese country is one of adventure: Anh nói chuyện nghe, chuyện đời chiến sĩ / Sống say mê, đường xa lắm khi nương hồn về quê. The mood in Một Mai Giã Từ Vũ Khí, however, isn’t adventure but duty: Trả súng đạn này, ôi sạch nợ sông núi rồi. The soldier has fulfilled his responsibility to the nation and longs to return to the familiar and quotidian of village life. I believe this song is still officially banned in Vietnam from commercial performances and recording. Yet as the case of many other banned songs, it is widely sung in private and semi-public space. The spirited singing and strumming of this young man is characteristic of the song’s strong emotional appeal. In contrast is an older man singing at a slower pace, allowing for more careful enunciation. Its popularity in the Vietnamese diaspora is evidenced by a number of recordings such as at a Little Saigon TV studio in Orange County and from major diasporic DVD labels such as Thúy Nga. One favorite version comes from Asia DVD, which is similar to others in employing a heavy-duty string arrangement. The song is usually performed by male vocalists. But there have been recordings from Khánh Ly in the diaspora and at least two major female singers before the Fall of Saigon: Thái Thanh and Thanh Thúy. The Thanh Thúy record is unique because, to my knowledge, it is the only one that to sings alternative (and original?) lyrics. Nonetheless, the best one, in my opinion, remains the original recording by Duy Khánh from the 1970s as seen at the middle of this post above. So identified with this song that Duy Khánh, himself composer of several well known songs, was frequently mistaken as its author. In the end, recognizing the proximity to Ngày Trở Về makes the song more poignant, more painful, and, ultimately, more cathartic. The Vietnam Conflict was long and brutal, and the linkage between these two classics is merely the latest reason to think of both wars as one piece and study them as such. There was a straight line from one war to another in suffering and, in this case, the desire for peace. Calling the Vietnam Conflict a tragedy is a cliché, truism, even platitude. It is more accurate to call it a series of tragedies – and, at times, an overlap of tragedies – of which the unrealized postwar vision painted in this song was one. It was the misfortune of the Vietnamese people that they were caught in a horrible combination of internal division and Cold War politics, leading to twenty years of warfare. It was their further misfortune that the postwar leadership failed to see the desire for normalcy from the Vietnamese masses as expressed by this song and, instead, hurried on with its radical revolutionary vision. There were attempts at reform, but they were half-hearted at best. The effects of the radicalism remain to this day, if evolved into less suffocating forms. For the time being, we are left with some great songs for listening, pondering, and, hopefully, leading to some sort of catharsis at the end of the day. Thank you for pointing out those parallels with the Phạm Duy song. This is one of my favorite Vietnamese songs. One I like even better is “Qua cơn mê” written at roughly the same time and in the same context. The latter is more of wish for a return to normalcy and has no direct acknowledgement of a state of war, even though the war has caused the “cơn mê.” That’s why it has received permission to be performed in Vietnam. I really liked “Một Mai Giã Từ Vũ Khí” because it carries the great universal theme “coming home” that is a hallmark in world literature since at least Homer’s Odyssey (and folk tales and folk music). It’s this theme that prompted me to put at the top of my list.